As the focast said, the weather wasn't good today. But it did not seem like raining. 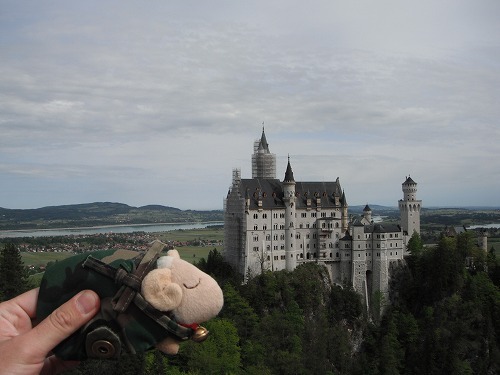 After breakfast, I rode to Schloss Neuschwanstein. Yesterday, I parked at the roadside as it was late afternoon and it wasn't busy, but today I parked at a proper parking spot. It cost 2 Euros. 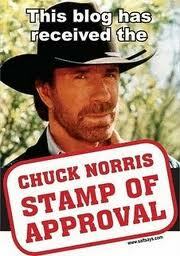 It was amazingly a reasonable price considering here was one of the mostpopular tourist destination in Europe. 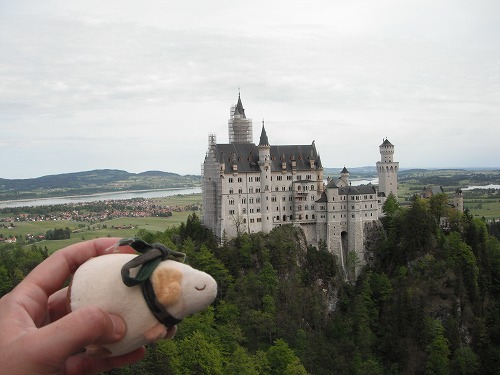 So, I started to hike up the mountain to the castle. At the bus stop, there were many many of Chinese tourists lining up... Oh, I forgot to take a photo. After 20 mins of walk or so, finally could see the castle - Schloss Neuschwanstein. The side which could be seen from the town was completely covered, but this side was not covered. 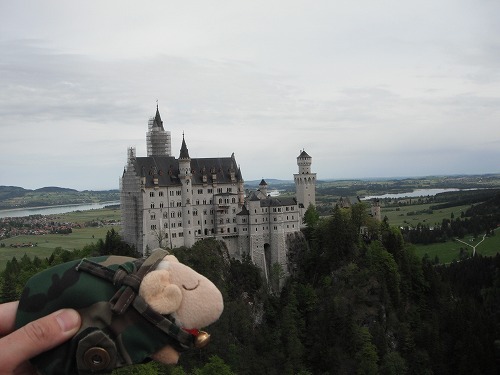 But from this place, I could not see the entire castle, I wasn't satisfied yet. 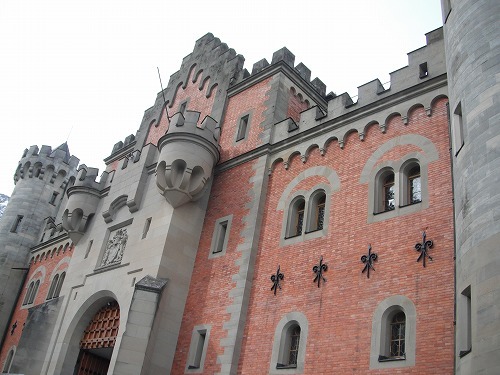 Here, the main gate, tons of tourists each day entering to the castle. I could see those Japanese tourists in group. Recently there have been less and less Japanese group tours. I have seen more Chinese or Korean group tourists nowadays. It looks like they took over Japanese tradition! Then I walked alogside of the castle and walked to Marien Bridge (Marienbrücke) where I would see the entire castleat a glance. 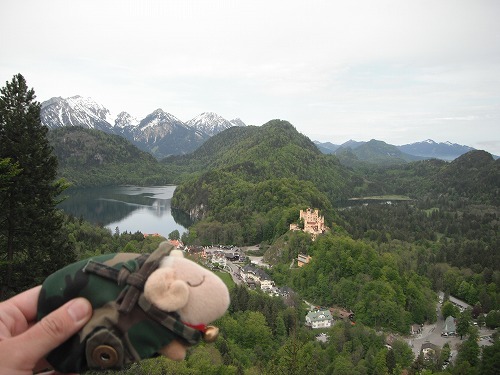 On the way to the bridge, I could see anothe castle "Schloss Hohenschwangau" and Lake Alp. It was a nice view, but if only the weather was better. Then I got to the bridge. 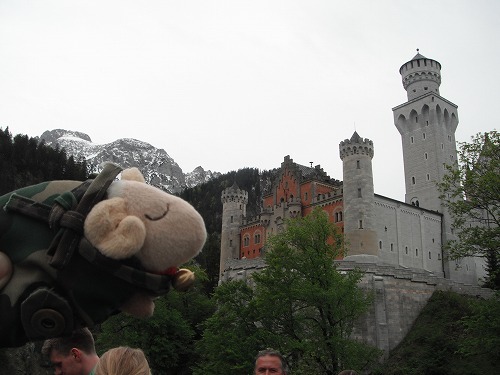 Wow, finally I could see the beauty of the castle "Schloss Neuschwanstein"!! Mr. Sheep was very happy too!! Sankaku liked the view too. The sun came out while taking photos! Woth the sunlight, the castle looked evern better. Hopefully I could take you the difference with the photo. 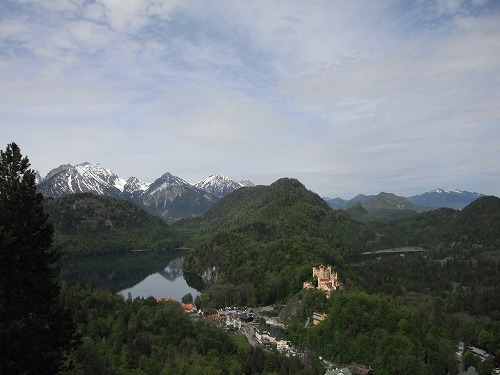 The view of Schloss Hohenschwangau and Lake Alp on the way back. It's different fromthe photo on the way to, isn't it? So in the end, it wasn'T 100% but still I could see the beauty of the castle as I imagined. Now I am happy. 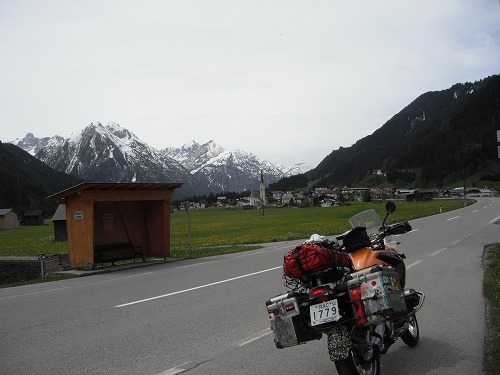 I went back to the town of Füssen first, then bought some breads and sausages, and had them at the carpark. Now I headed to Austria. 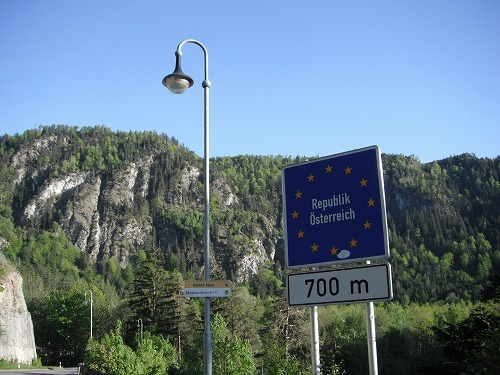 A sign showing 700m to Austria. I did not take a main highway but took those back roads. 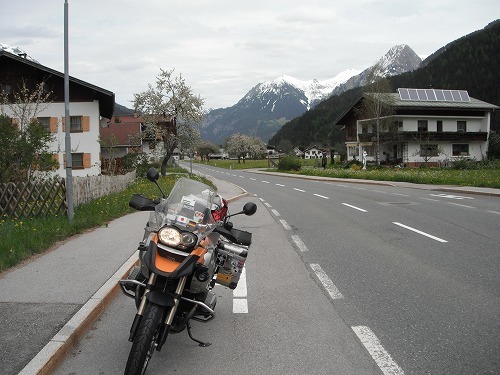 I rode through small towns and getting closer to Alps. Then whe I realised, I was already i Alps! 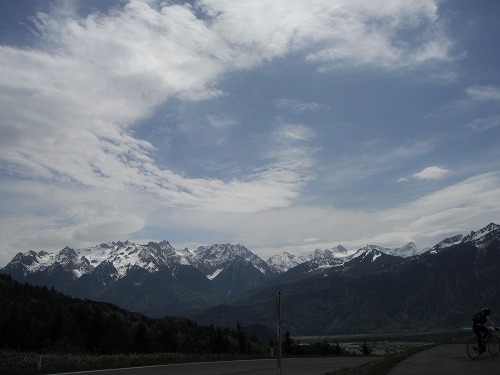 The surrounding was all snow mountains. Gradually, I rode up higher and higher. 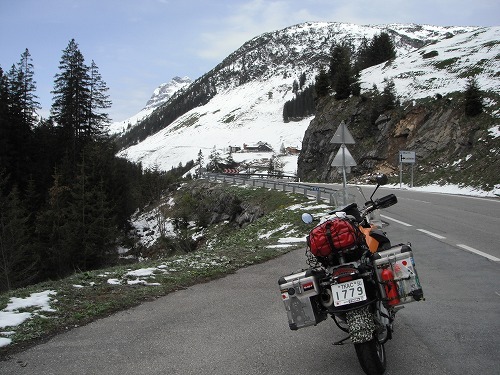 Then there were snow at the road side!! 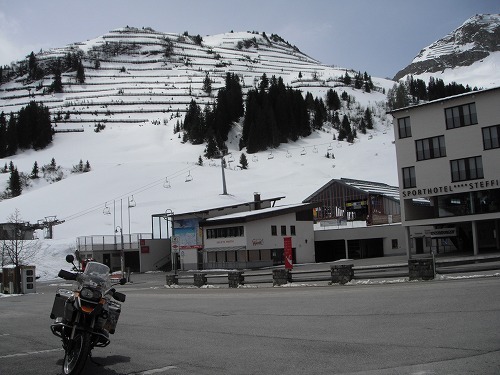 It's the middle of May already but some roads through Alps are not yet opened. I wondered if the road I was heading would be opened. The snow at the road side was still soft. Then I was completely i the middle of snow!! 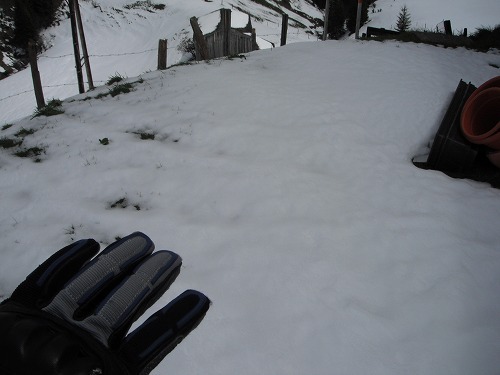 The altitude was little more than 1,500m but as there was around 47 degree north, many snow still remained. Then gradally riding down the mountains. Austrian small towns looked nice but somehow it smelt like house shits and bull shits!! In Germany it did not smell like that. I arrived Feldkirch around 3pm. 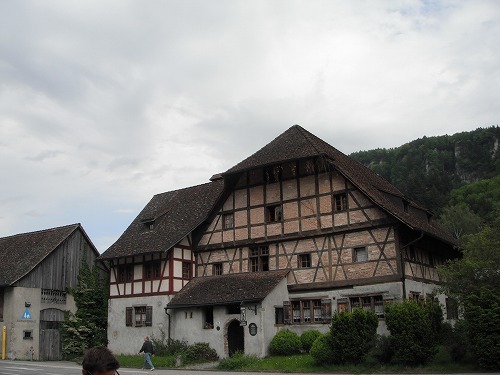 I checked-in at Youth Hostel - Jugend Herberge Feldkirch. The old house was renovated into this hostel. It was pretty col looking and clean hostel. I went to a supermarket to buy some foods and back to the hostel to take a shower. Now I am relazing at the loune. I will stay here for 2 nights, so I will explore the town tomorrow. 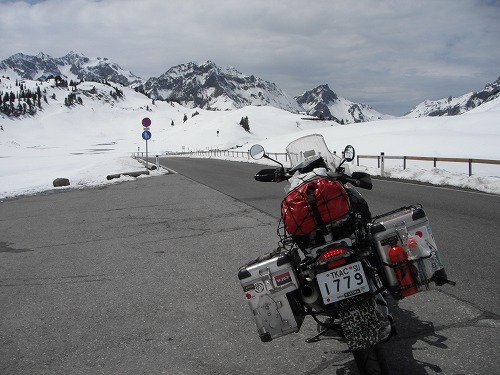 If it will be a good weather, I might ride to the neighbourhood country Liechtenstein. I am competing in "Round the World Trip Blog Ranking". Please click the button to make my blog No.1! !